Welcome back to Cynsations, and congratulations on the release of Chronal Engine (Clarion, 2012)! 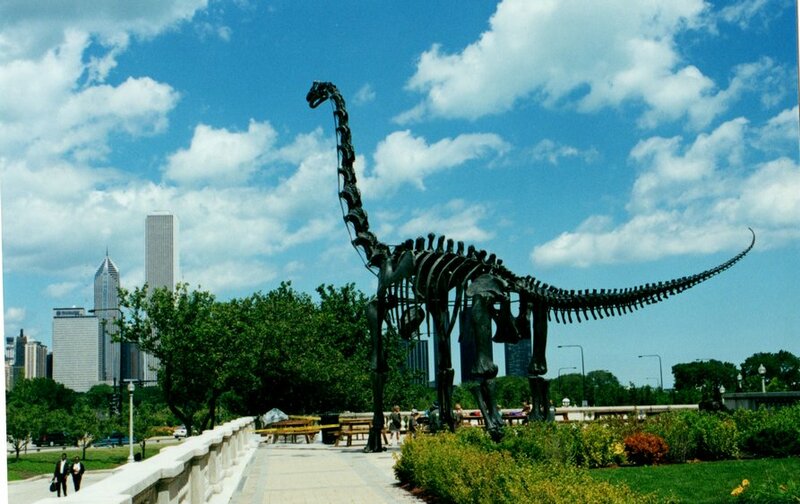 What are your childhood memories of dinosaurs? As an adult, what fascinates you about them? I was (and am) extremely blessed by having parents who supported reading and education. Some of my earliest childhood memories are of going to the Hild Library in Chicago and coming home with grocery bags full of books. Others include my parents taking my brother and me and our friends to the city’s fantastic zoos and museums: the Lincoln Park Zoo; the Brookfield Zoo; the Museum of Science and Industry; the Adler Planetarium; the Shedd Aquarium; the Art Institute; and the Field Museum. Although I was a little creeped out by the mummies at the Field, I remember being fascinated by the dinosaurs – the brachiosaur in the main hall, alongside the fighting elephants and the Pacific Northwest totem pole. This was stuff that was so different from my everyday experience, but the extraordinary thing was that they were real. How can you not be captivated? Beyond that, one or my biggest memories of dinosaurs was reading Butterfield’s The Enormous Egg, the story of a boy in Maine whose hen lays an egg that hatches into a Triceratops. It was one of my favorite books when I was a kid. Probably by the time I was five, I could’ve told you the names of every dinosaur out there. After a while, though, I didn’t really think a lot about dinosaurs. I sort of paid attention when there were news reports and suchlike, but had other interests, and there wasn’t a lot of fiction about dinosaurs. But when I was in high school, at the old Kroch’s and Brentano’s bookstore down on Wabash under the train tracks, I picked up a copy of Robert Bakker’s The Dinosaur Heresies. In it, he talked about dinosaurs being warm-blooded and related to birds, and I was absolutely thrilled. 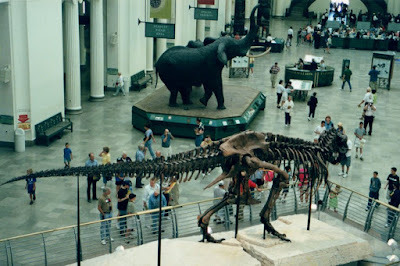 And, by the early 90s, the news was exciting: in addition to Spielberg producing "Jurassic Park," there was news that paleontologists had found feathered dinosaurs. And that birds were descended from dinosaurs. 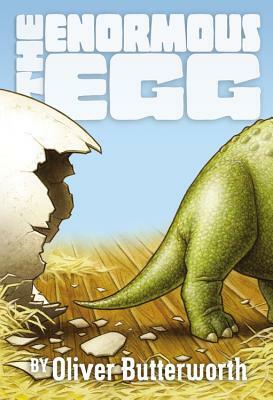 (Of course, I was a little blasé about this since, after all, I had already read The Enormous Egg…). How about time travel? What are your favorite related stories and why? For time travel, I want to blame "Star Trek," but I’m not really sure. 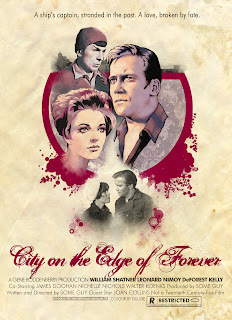 “The City on the Edge of Forever” is one of the best science fiction TV episodes ever. "Star Trek," of course, did a lot of time travel thereafter, too, and I was a big "Star Trek," fan so I guess I kind of absorbed a lot of it. I also remember that, every Sunday, WGN would have a movie hosted by Frasier Thomas called “Family Classics,” and one of the movies they’d show regularly was "The Time Machine," based on H.G. Wells' novella. Granted, the Morlocks were a little weird, but it might have been one of my first introductions to time travel and future dystopias. 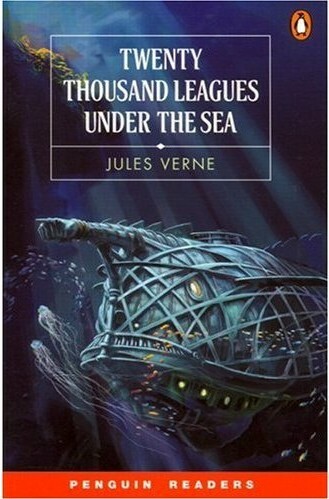 I read a ton of science fiction – Heinlein, Bradbury, etc. -- and time travel tends to be an important sub-genre. The “takes” on it are not necessarily clear or even logical sometimes, but they tend to be a lot of fun and thought provoking. Also, when I was in high school, "Back to the Future" was one of my favorite movies, for its sheer exuberance and hilarity. What inspired your departure from realistic fiction to science fiction? Were you a big science fiction reader as a kid? Today? What sci fi do you enjoy from other media? My first two novels are contemporary comedies, but they still have science or science related themes, so I guess the thought has always been there. But I didn’t jump into “speculative fiction” until I had a story that justified it. As a teen, I read almost everything by Asimov, Bradbury, Clarke, Heinlein, McCaffrey, just to name a few. Orson Scott Card’s Ender's Game is one of my favorite books ever. 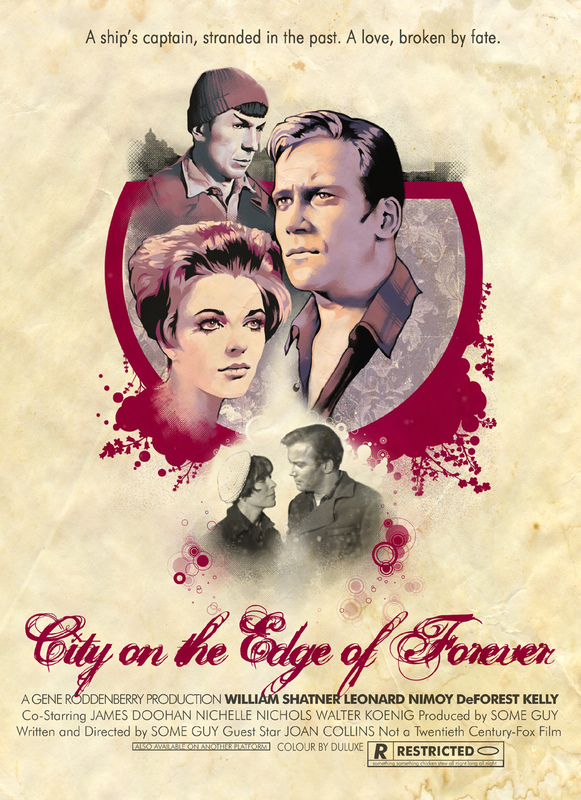 And, of course, there’s "Star Trek," although I suppose technically it’s science fantasy rather than science fiction. "Star Wars," even more so. Cyn Note: I fail to see how "Star Wars" is any more a fantasy than "Star Trek." Really. Today, I do read science fiction, although I haven’t been reading the newer adult authors, mostly the middle grade and teen authors. Much of the science fiction of late is of the dystopian variety, though, which isn’t really my first “go to.” (Even as I say that, I should note that I’m looking forward to the movie "Ender's Game" and I enjoyed Dashner’s Maze Runner and Collins’s The Hunger Games trilogy and am looking forward to that movie, too). Also, ever since I read Alas, Babylon, I’ve really enjoyed a good post-apocalypse novel. (Even better if it involves an alien invasion). 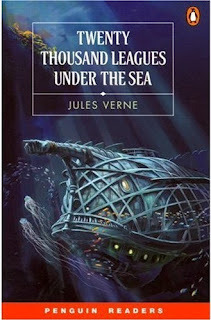 Due to the world building, heightened logic and research burdens, I could make an argument that there’s no category more challenging than historical speculative fiction. What advice do you have for writers on that path? You have to get both the historical part and the speculative part right. Or as close as close to right as you can. I tell people that, when researching historical (or any other kind, really) of fiction, you have to do enough research that you get to know all the things you don’t know. Also, you should be aware of the assumptions you make going in. An early draft of Chronal Engine has a whole bunch of “really cool” dinosaurs together in a rather unique ecosystem that could never have realistically existed. Once I had my research down, I had to give up a few of them. How about those writing time-travel stories? Time travel is perilous because you have to sort of pick your poison. You need to at least consider whether it’s a universe in which you can change the past (and therefore the future). Of course, this leads to the grandfather paradox. And, if you can go back, is there a butterfly effect or, in contradistinction, do changes you make asymptotically dampen the farther back you go? Or, are there multiple universes and does everything you change cause the “creation” or another universe? In which case, the characters can come back to the “present,” but never their present. Or, are there closed time loops, which leads to the “two objects” paradox when you take an object to the past and leave it there only to find it, except that now you have two of them (and which I invoked in Chronal Engine)? The key, I think, is that you have to make it consistent. Or at least as consistent as you can. In Chronal Engine, I tried to make it at least somewhat ambiguous, though, because I don’t think that they (the main characters) would know what the rules of time travel in their universe are. The character Professor Pierson might, of course, but he’s another story entirely. 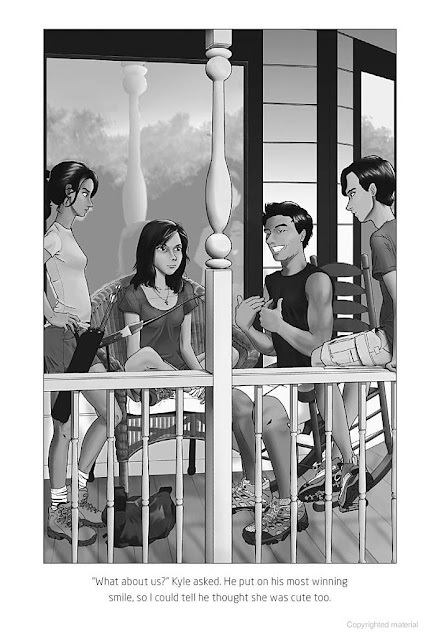 Chronal Engine features interior illustrations by Blake Henry. What did his art bring to the book? I was absolutely thrilled when my editor told me the book was going to be illustrated. One of the hardest things to convey when talking about dinosaurs is the sense of scale. 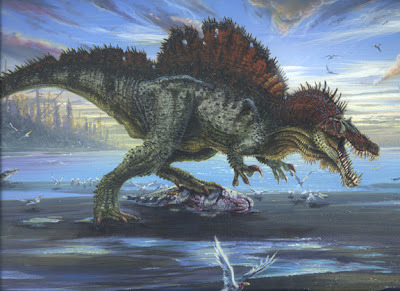 Blake’s illustrations manage to do that and to juxtapose the familiar with the Cretaceous, terrifically. Reproduced with permission (Clarion/Houghton Mifflin Harcourt). He also captured the characters’ personalities, in both the quiet moments and in the action sequences. There’s been some discussion in the kidlitosphere of the need for more books that feature protagonists and main characters of color, especially in areas like speculative fiction where they’re particularly underrepresented. How is that kind of diversity reflected in your story, and what is your thinking—as a reader and a writer—on this topic? My protagonist, Max is the youngest of three children who are hapa haole. Their parents are ethnically Japanese (“Takahashi”) and Caucasian (whatever “Pierson” is). Their friend Petra, who is the daughter of their grandfather’s nurse/housekeeper/major domo, is of Mexican and German heritage. This is not dwelled on in the novel, not made an “issue” of, and indeed, not particularly important to the story. So why did I make a point of including it? The easy answer is that, while they are unique persons, in some sense, they represent modern reality and the modern and historical reality of Central Texas. Particularly when you’re writing a time-travel novel, you have to be cognizant of such things. To me, the willing suspension of disbelief extends to the ethnic makeup of the characters. There is, however, a little more to it. 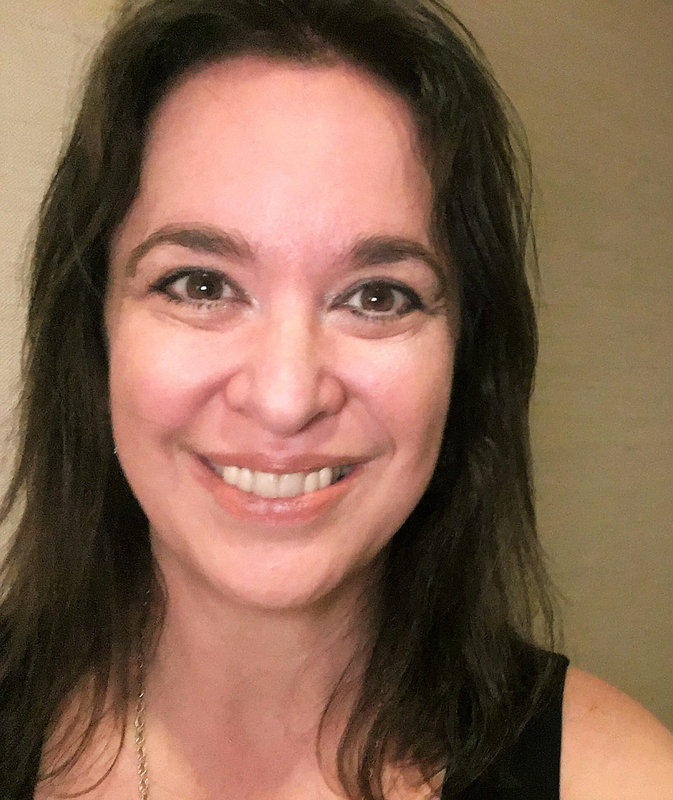 I am of German and Japanese descent (My father (German American) is an immigrant, while my mother’s (Japanese American) family has been here in the States for several generations). Growing up in the 1970s and 1980s, there was no dearth of depictions of Japanese and Germans. Of course, they were usually trying to bomb Pearl Harbor or London, respectively. (And then-contemporary Japanese were nefariously trying to take over the world with high-quality, fuel-efficient automobiles and cheap DRAMs.). 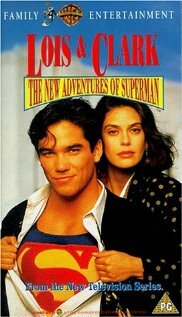 There generally were no depictions of hapa folks, except in a “caught-between-two-worlds” trope sense. (For this, I blame “Star Trek.” And Mr. Spock.). And you know what? It didn’t really (often) matter to me. Part of it, of course, is that while I am of German and Japanese descent, I’m also American by birth and, to a large extent, culture. There is no way, for example, that I could go to Japan or Germany and not have everyone instantly know that I’m not a native. Also, I was and am willing to read books about people of all shapes, sizes, colors, and creeds, and even some about hobbits. Although I did (and do) find the fact that the latter didn’t wear shoes to be somewhat alarming. At the same time, my ears did (and do) tend to perk up a bit when I hear that someone in the public eye or a fictional character is hapa. 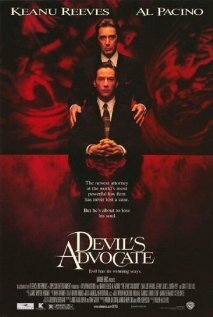 It doesn’t make me absolutely rah-rah for them -- there is no force on earth, for example, that could make me argue that Keanu Reeves deserved an Oscar for his role in "The Devil’s Advocate" or that Dean Cain deserved an Emmy for "Lois & Clark" (regardless of the fact that my wife finds them attractive). But there’s still something, and I really haven’t been able to come up with a logical non-emotive sense of why. It comes down to a gut sense that, with regard to diverse depictions in media, generally speaking, I think there is virtue in the familiar, whether it’s racial or cultural or regional. For example, I grew up in Chicago back when very few movies were made there. I remember how I and other people reacted when we first saw movies set and filmed in the city. 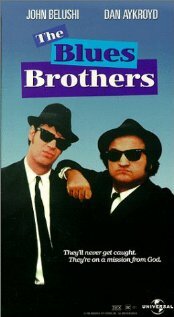 Some of my friends’ parents actually took them to see "The Blue Brothers," even though they were technically too young for it, simply because it’s set in Chicago and shows places they were familiar with. Do I think this sort of insider/behind-the-scenes knowledge is necessary for the enjoyment of books and other media? No. But it’s nice to know that, sometimes at least, it’s there. So, yes, I think it can enhance the literary or cinematic experience to see reflections of yourself in books and movies, especially -- and I think this is really the key -- when you’re not used to it. Cyn Notes: (1) Keanu and Dean, please disregard the previous comment about your work. (2) Greg, you are every bit as cute as Keanu and Dean. There is no need to begrudge them their well-deserved awards. You write both within and across culture lines in crafting your characters. What advice do you have for writers trying to do the same/either? I think regardless of where characters stand with reference to the culture line, you have to treat them as real people. They’re not just poster children for particular ethnicities or skin colors or exemplars of -a social studies lesson. And they can and should react in non-typical ways. Really, I think the best thing anyone can do when writing across or about the culture lines is to keep a sense of humor. Imagine you have been given a Chronal Engine. Would you use it at all? Why or why not? And if so, where would you go and why? If I had evidence it had been used before, absolutely. If not, that might mean there was danger of screwing up the space-time continuum, so I don’t know. Let’s say you have to go to the Cretaceous. What are the first three things you have to do to survive? Realistically, probably the same things you would need to survive if you were plunked down in the Serengeti or in the middle of the Amazon. So, something to make sure you could have pure water and could start a fire. And, something to defend yourself with. Enter to win a signed copy of Chronal Engine and a T-rex puppet! 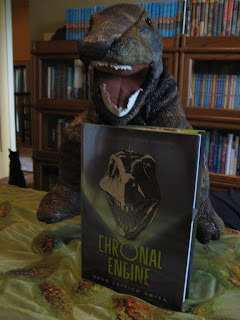 Runner-up prizes: two more signed copies of Chronal Engine. To enter, comment on this post and include an email address (formatted like: cynthia at cynthialeitichsmith dot com) or a link to an email address. Or you can email me directly with "Chronal Engine giveaway" in the subject line. Note: For extra chances to win, blog, tweet (hashtag: #chronalengine), facebook or Google+ this giveaway and list your efforts in your entry! Author-sponsored. Eligibility: North America. Deadline: midnight CST March 31. Check out the Chronal Engine Activity Kit. Process Talk: Greg Leitich Smith on Chronal Engine (Setting, Genre, Audience) by Uma Krishnaswami from Writing with a Broken Tusk. Peek: "I’ve always been interested in this idea of what would happen to people without their modern amenities. Part of this is that I grew up on family stories of my parents and grandparents living without indoor plumbing, electricity, air conditioning. And my father and a lot of friends of the family were refugees during World War II, so I also heard some rather harrowing stories about scrabbling for survival." 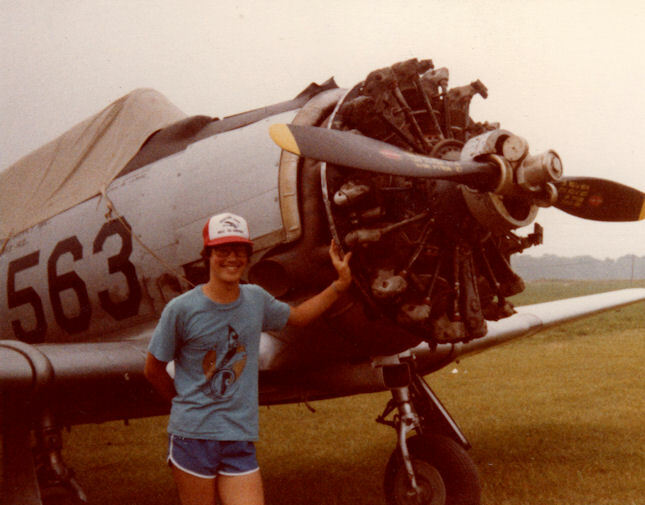 Don't miss part two, Process Talk: Greg Leitich Smith on Chronal Engine (Culture, Humor, Time). 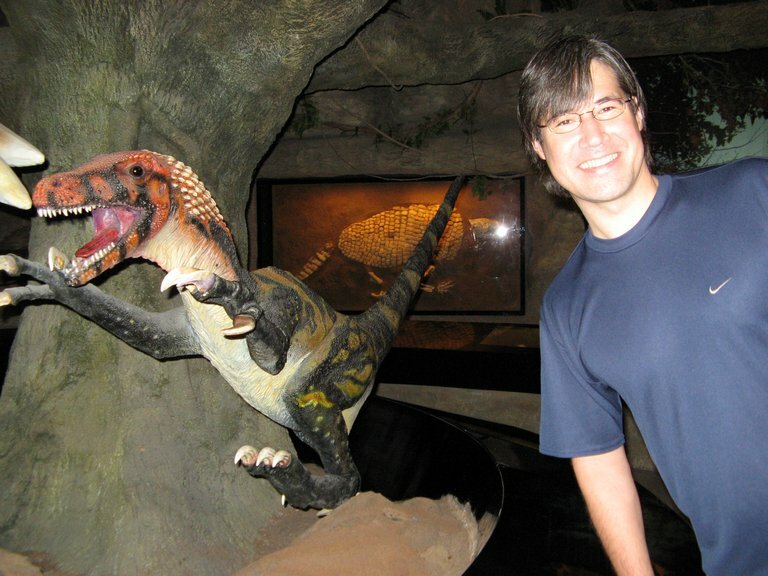 Greg Leitich Smith: Dinosaurs, Writing & Research by Sarah Blake Johnson from Explorations. Peek: "...that’s basically the thing that draws people to dinosaurs: they were real. Not monsters, not dragons, but real flesh-and-blood animals that walked the earth. Even better, they’re a kind of science that’s easy for laypeople to participate in, at museums or even hunting for fossils on their own..."
Writers and Illustrators and Dinosaurs: a celebration of children's-YA authors, illustrators, and other book lovers--each photographed with a dinosaur or other prehistoric beast. Want to join in the fun? Send Greg a picture of yourself with the paleo beastie of your choice! See examples featuring Kathi Appelt, Debbi Michiko Florence, David Ostow, Tim Wynne-Jones, Jane Yolen & more! 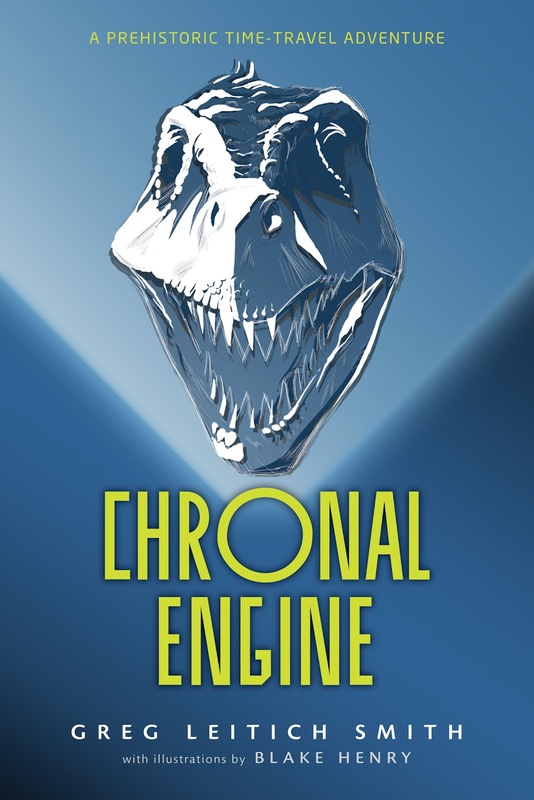 Greg Leitich Smith will launch Chronal Engine (Clarion, 2012) at 2 p.m. March 24 at BookPeople in Austin. The program will include an author presentation, signing, and refreshments. I loved The Enormous Egg and the Field Museum, too! Congrats! on such a great book idea. I'll have to read it. Awesome interview! Would love to read Chronal Engine. My boys would love it. What a great idea, combining dinosaurs and time travel. I'm amazed that it hasn't been done before. Sounds like a book I would love to share with my students. A shocking display of nepotism, and quite well done too. I also had shorts like that in the 70s but no photos survive. Do you think those will come back? 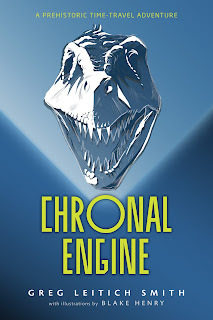 Congrats on the release of Chronal Engine and thanks for the opportunity to win a copy. Congratulations on the release of Chronal Engine! Best wishes. 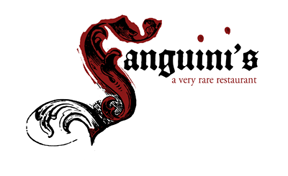 I'm looking forward to this one--thanks for the great intereview! Oh, I Tweeted. Excuse me. Really enjoyed reading this interview! Two talented writers in the family, or are there more? Great interview! I've always found dinosaurs fascinating. Wowsa! I can think of a whole group of students that would love this title, not to mention their favorite librarian. If we are lucky enough to win the giveaway please notify me at mmmcu at charter dot net. I throughly enjoyed this interview in the early hours of the morn; the conversational tone and asides by Cyn. What a great way to start my day! Thanks. Thanks everyone! And good luck on the drawing! I love The Enormous Egg and Ender's Game. I tend to give them to everyone I know as soon as they're old enough and sometimes before! I know readers who will love Greg's new book! Including me! Never thought about combining time travel with dinosaurs....brilliant! teachers would love this book for their classroom. Great interview. I can't wait to buy my copy on Saturday. Although I would really like that dinosaur. And I agree with Cyn, Greg is way cuter than Keanu. Oh, how I wish I could have been there. What a brilliant launch party. I can't wait to read the book! So sorry I couldn't be at the release party. I love dinosaurs! Thanks so much Cynthia for making these giveaways available! I love the mix of genres that are highlighted!